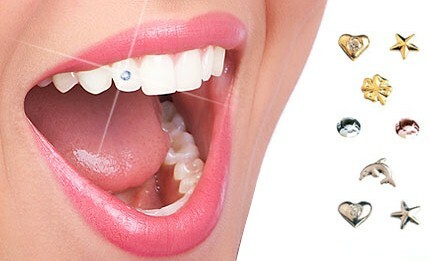 Dental Jewellery is a brilliant way to add sparkles to your smile and stand out of the crowd. During a painless procedure, we fix a jewel on your tooth surface. The jewel does not damage tooth tissues and has no side effects – except for the increased charm of your smile! Call it an oral fashion statement to stand out among ordinary mortals or simply an effort to blend in with the bold and the beautiful. If somebody thinks he or she was better off without Dental Jewellery, it can be easily removed without any side effects on the dental tooth structure as the procedure is non-invasive. What's more, tooth jewellery can be fixed again at a later stage.